I’m going to be straight with you: this post started with me Googling “bathroom ghost.” I was looking for a monster of a different sort–I enjoyed our Toys-R-Us(™) spirit a while back, and was hoping I could find something similar. Though it’s a little more posh, I came up with the Hotel Galvez. Modern-day Galvez seating area, captured by Patrick Feller. Close up on Galveston, Texas: I’m not on the up-and-up of big vacation hotspots and so didn’t recognize the name, but some of you might. It’s an island in the Gulf Coast, set up to provide the perfect getaway: beautiful beaches, pools, an amusement park, and, of course, luxury hotels. The Hotel Galvez is a king among these, nicknamed the “Playground of the Southwest.” It has been frequented by people like Franklin Roosevelt, Dwight Eisenhower, Richard Nixon, Lyndon B. Johnson, Duke Ellington, Dean Martin, Frank Sinatra, and Jimmy Stewart. It’s a beautiful, massive building replicated to look just as it did when it first opened in 1911. At the time, it was heralded as a symbol of renewal. 11 years before, the deadliest storm in U.S. history swept through Galveston and killed somewhere between 8,000 and 12,000 people. Word had it that the inhabitants of an orphanage were among the dead–in one case, the remains of a nun were found still tied to those of the children she was trying to lead to safety. There were so many bodies among the wreckage that the remaining Galveston residents decided to bury them en masse at sea. That didn’t work so well: the next time the tide came in, bloated, rotting corpses came in with it. These were hastily burned, and the island resumed its struggle to rise from the sodden ashes. The Hotel Galvez in all its glory, brought to you by Galveston.com. The Galvez helped rebuild Galveston, bringing in tourists and money. It also brought lovers. In the late 1950’s, a woman named Audra stayed there to wait for her fiance, a sailor due to come in from Gulf for their wedding. Naturally (as I’m reporting her story on Monster Meet), Audra’s love was doomed. Her fiance’s ship went down in another terrible storm; Audra was told no one made it out alive. She hung herself upon learning the news–either in the bathroom of her room (501 or maybe 505, depending on who you ask), or in a turret elsewhere in the hotel. Because life is cruel, Audra’s fiance showed up shortly thereafter, in perfect health and anxious to see her. For those of you keeping track, we now have 8,000+ violently dead, including nuns, orphans, and a heartbroken bride snuffed out at her prime–three types of ghosts so common as to be almost stereotypical. The stage is set: now let’s turn off the lights and watch what happens. Galvez dining area cerca 1911, courtesy of the DeGloyer Library, Southern Methodist University. Unless they are in the habit of Googling “is this hotel haunted” as part of their vacation planning, guests at the Galvez may at first have no idea that anything is amiss. Then they might notice a painting in the hall whose eyes seem to follow them, or pass two strange women in 19th-century outfits who vanish before you can look at them twice. The ladies bathrooms can also hold a surprise: on the most casual end of encounters, toilets flush repeatedly over the disembodied sound of children laughing. * On the more intense end, sobs fill the empty bathroom and the stalls rattle violently, making it very difficult for the living to poop in peace. They’ve got good reason to be jaded. If the guests are put upon, the staff are twice so. One woman’s dusting was interrupted by the erratically flushing toilets and invisible laughing children; she ended up having to yell “I’m in here” to get them to stop. Another came in early for her shift in reception and received a call from one of the rooms that was not only vacant, but also in the middle of being renovated and had no phone in it at all (no one spoke on the other end of the line, and when the poor woman hung up, she realized her phone wasn’t even turned on, either). There have been glasses that fly off of tables and break themselves, candles that blow out on their own, and the presence of a strange man in the corner of the laundry room. Then there’s dealing with the ghost hunters. The Galvez attracts plenty. Some come in low-key with EMF detector apps on their phone (yeah…I don’t know about that one, either) to see what they can find. One woman said that she communicated with Audra using the app: she asked Audra about herself, and Audra’s response was “Bathroom. Ow.” Other hunters come in with more advanced equipment, with more dramatic results. The Galveston ghost hunters went to stay on the 5th floor while it was being renovated, and witnessed all of the room doors slam against their safety catches for a few minutes. 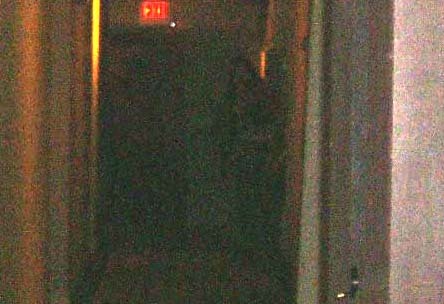 They also captured the image of what appears to be a nun. Fortunately for everyone, the ghosts of the hotel Galvez don’t appear to have any darker plans than to be mildly irritating. So far. Business at the hotel seems to be doing well, whether in spite of or because of the ghosts. Between wedding pictures and shots of a brilliant blue pool, the Galvez Facebook page showcases a photo of a cocktail named “Ghost Bride,” so they don’t seem to be afraid of cashing in on their unorthodox reputation. Whether you’re looking to tan on the sundeck or poop your pants in long, empty hall of the 5th floor, the Galvez seems like the place to be. Have you ever heard someone flushing the toilet while laughing maniacally? Have you been that person? Share your story in the comments below. *Proof that bathroom humor never dies.